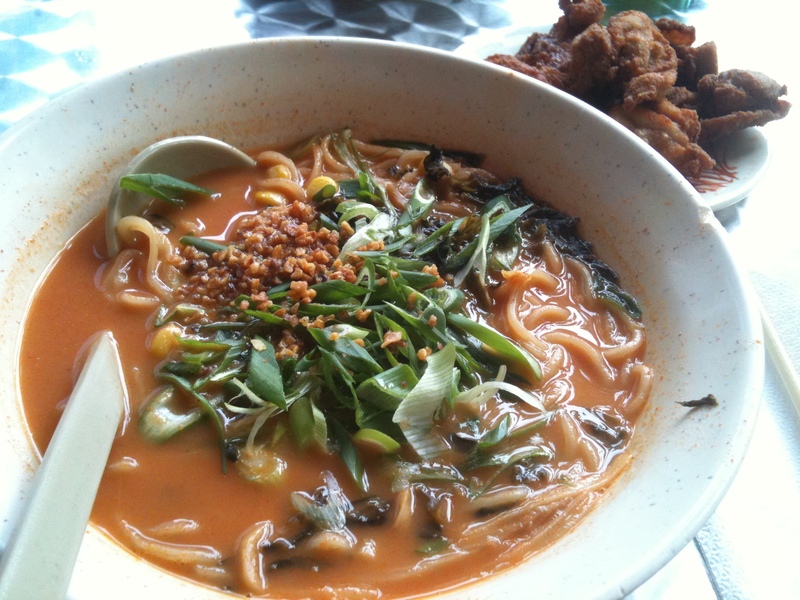 Beppu Dining Restaurant’s Spicy Chicken Ramen. Happy new year to my dear readers. 🙂 May 2011 bring to you loads of laughter, joy and good conversations over delicious food. Here’s my first food review of the year – Beppu Dining Restaurant’s Spicy Chicken Ramen (aka Japanese noodles). Food rating: 3.5 over 5 stars. Service: 4 over 5 stars. I wouldn’t consider this ‘authentic’ Japanese ramen (bouncy noodles in soup, served with chicken/pork soup that’s boiled for hours), but I would say it’s a pretty good lunch-fix for ~S$12-15 per person (drinks included). P.S: I’ve not tried their Japanese Shabu Shabu, anyone has and is it yummy? Dinner Photos With My Dear Fuji Finepix F31. I finally had my fixed up Fuji Finepix F31 camera delivered to my place this evening! 🙂 And I just had to use it to snap away at my dinner. I was so close to kissing my camera, heh. 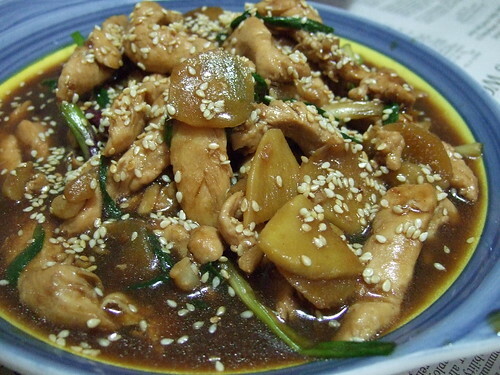 Sesame chicken, stir-fried with ginger and spring onions. 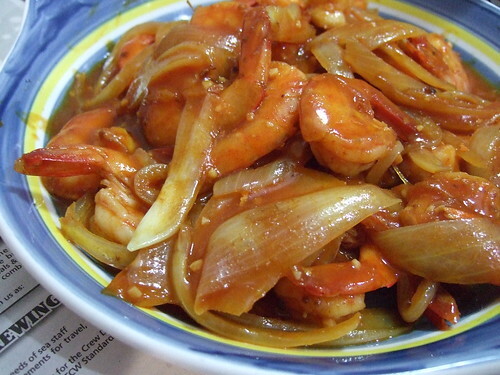 Prawns and onions in a super spicy sweet and sour sauce. It was my favourite dish tonight. Dinner isn’t complete without a vegetable dish. 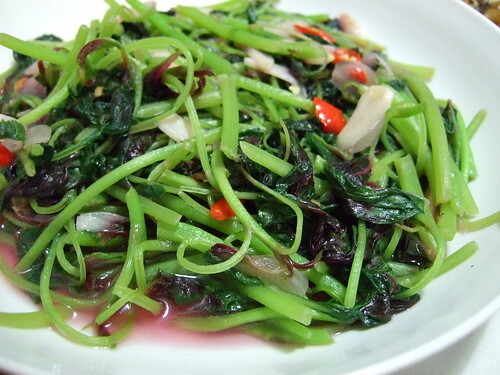 Spinich with chilli-padi. 😀 I am so happy I got back my fabulous camera. 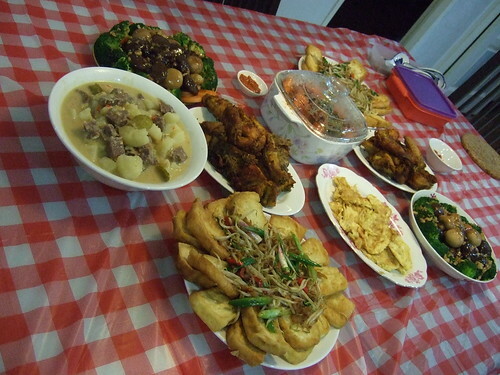 This was a meal cooked for my entire family, just before a Mahjong game. There was mutton & potatoes in coconut sauce, broccoli & mushrooms, fried tofu with bean sprouts, fried chicken, egg omelette, prawns in tomato sauce and a soup dish (not shown in the photo). This one is a simpler dinner for 5. I didn’t manage to take a photo of the soup. 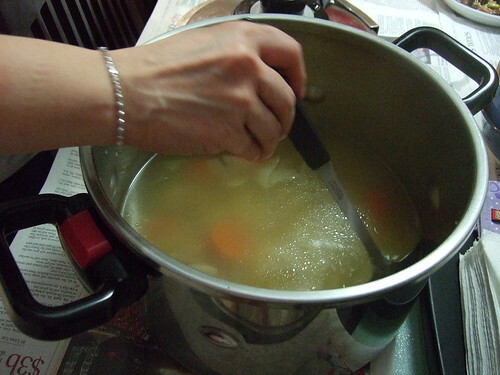 In Cantonese meals, it is a must to have a soup dish. My family believes in cooking our soup in a pressure cooker to attain the best results. 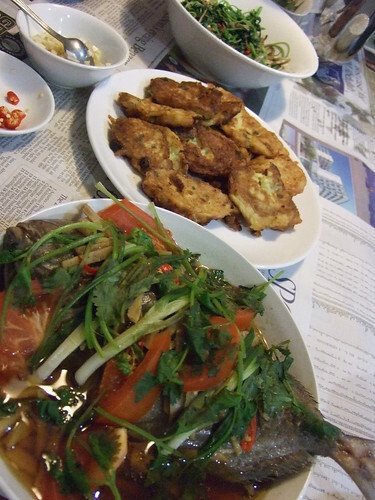 In this meal, there was steamed fish, deep fried mashed potatoes and spinach. As much as I love eating home-cooked meals, sometimes it is nice to eat out. 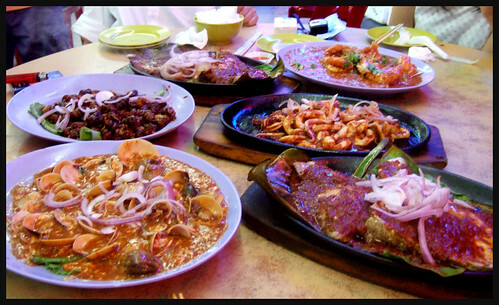 I consider Singapore to be a food paradise, with many 24-hour eateries to choose from. There is always something to eat.